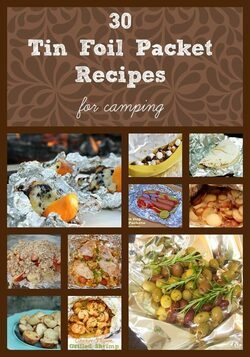 Credit for photo and more foil recipes here. Make them ahead. No prep at camp. No pans needed. Also works for home meals. Slice into 1-2 inch pieces. Wrap entire loaf well (or halves if that fits your bbq better) with heavy-duty aluminum foil. Double wrap foil to ensure sealing. In skillet, melt butter, sauté mushrooms. Season with garlic and salt to taste. Drain well. Mix all together. Drain well. Slice French bread longways to open, but do not cut all the way through. Wrap entire loaf (or halves if that fits your bbq better) in aluminum foil. Double wrap to ensure sealing. Grill 20-30 minutes, until cheese melts. Or bake 400 for 15 minutes. Fold aluminum foil, allowing for expansion. Double the aluminum foil to ensure sealing. Bake 30-50 minutes at 350 until chicken is cooked. Grill: 10-15 minutes to reheat. If just grilling, 25-35 minutes until chicken is cooked, turning at 10-15 minutes. Time varies according to coal temperature, grill heat, etc. Add other toppings as desired. Heat individual tortilla to make bendable. Layer pepperoni, sauce and cheese. Wrap in aluminum foil. Double wrap to keep from burning. Put eggs and whatever leftovers you have in a ziplock bag. Put in pan of boiling water. 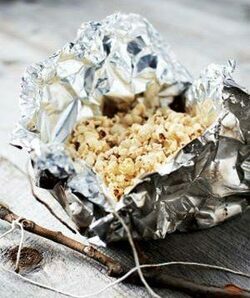 Wrap cone in aluminum foil, allowing for expansion. Grill till contents melt, turning when needed. Whipped cream would make it even better. Slit banana skin to insert toppings. See campfire cones for suggestions. 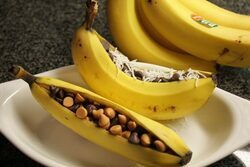 Grill till chips melt, banana is soft, turning when needed. Tie to stick with string. Shake over fire or grill until popped. Place in 1 gallon-sized Ziplock bag with ½ c ice cream salt and half bag ice cubes. Toss. Shake. Throw. Within 10-15 minutes, ice cream forms.